What does 'Trade a minimum of 5 days' mean and what happens when I complete Step 1? When and what products can I trade? What is the Daily Loss Limit and what happens if I exceed it? What is the Trailing Maximum Drawdown? What does Maximum Position Size mean? What is the Weekly Loss Limit? What releases do I need to be flat for? What is the scaling plan? If I break a rule, does my Trading Combine® automatically close? Will I be charged commissions and fees in the Trading Combine®? The Trailing Maximum Drawdown is best thought of as a minimum account balance. For instance, the Trailing Maximum Drawdown for our $50K account is $2,000. This means that when you start the account your balance cannot drop below $48K. This number is calculated at the end of the trading day in the Trading Combine®. Which means that at any point during the trading day, you can drop below the minimum account balance, but you must be above it when the day ends. This rule is updated at the end of each active trading day. You can keep track of the rule in relation to your account using your dashboard. In the Funded Account®, this rule is calculated intraday, which means if the balance falls below the minimum account balance you will be pulled from your trades right away and the rule is considered broken. 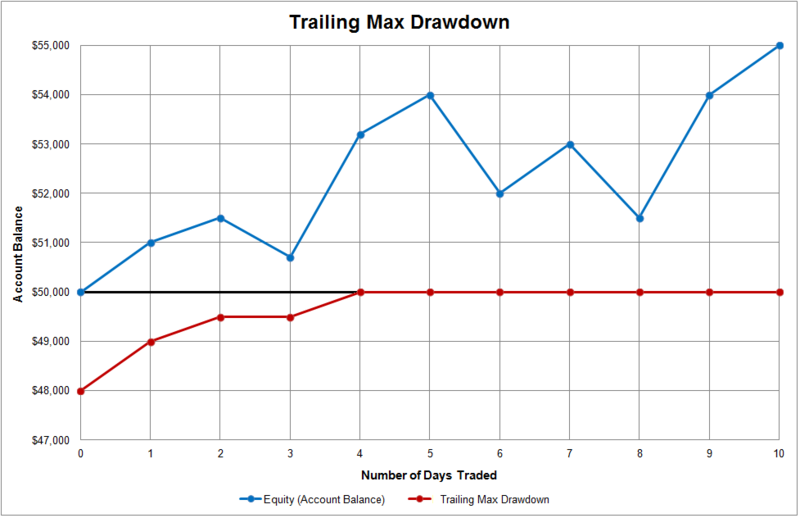 The Trailing Maximum Drawdown is calculated from your account balance high. So, if you make $500 on the first trading day your account balance will be $50,500 which will make your Trailing Maximum Drawdown $48,500 ($2,000 from the account balance high). If you were to lose $500 the next day your account balance goes back to $50,000, but your minimum account balance will remain $48,500. This number will not go below $48,500 for the remainder of that evaluation period. Also, once the Trailing Maximum Drawdown reaches the initial starting balance of your account, it won’t change for the remainder of your evaluation period. This means that if you were to make $2,500 the next day and your account balance is $52,500, your Trailing Maximum Drawdown will move up to $50,000 and stay there until the account is passed into Step 2, reset or canceled. The starting balance of your account will either be $0, $30K, $50K, $100K or $150K.